This home was built by E.S. McBride in 1912. 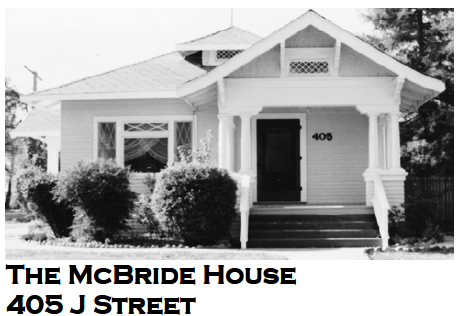 Mr McBride was one of Davis’ first councilmen and was also the first president of the Businessmen’s Association. years of schooling. As a young man he was employed by the Southern Pacific Railroad. In 1906, Mr Hampton, owner of the Davisville Lumber Yard, offered him a job. He continued to work for the same company for the next forty-six years. In 1922, he became a co-owner of the lumber yard with E.T. Robie. In addition, he served on the school board and was instrumental in organizing the first Davis high school. On March 20, 1917, 404 of Davisville’s population of 979 inhabitants turned up at the polls to vote to incorporate Davisville as a municipality. The vote on March 20th was 317 for incorporation and 87 against. The city’s incorporation was recorded with the California Secretary of State on March 28, 1917. The first elected “City Fathers” were J.B. Anderson, S.H. Beckett, C.A. Covell, B.T. Brewster, and E.S. McBride. E.S. McBride married Lillian Hoag, daughter of pioneers George Benjamin and Mary A. Conrad Hoag. They had six children; Lucille, of Antioch; John, of Vacaville; Jean (married Ernest H. Stanford), of Davis; Edwina (married Clarence Fisher), of Petaluma; Ruth (married Frank Zink), of Salinas; and Marylou (married William Hickey), of Placerville. This one story Craftsman house, built in 1912, has a hipped primary roof and gabled porch roofs. Both the hipped section and the gable portions have a flare at the cave line. The main portion of the roof is punctuated by a centered, attic dormer window. The porches are railed partially by slatted rails and partially by solid parapets which act as pedestals for numerous Tuscan columns. The front porch has a small window opening within the pediment. Front and side porches offer entry into the house. The porches and roof lines of the house are accented by wide overhangs supported by prominent brackets with decorative profiles. Some of the tripartite configured windows have sections with diamond shaped panes. The house is sheathed in narrow clapboard. What has happened since the McBride’s lived here? The carriage house, located to the west of the house, was converted into a rental cottage in the late 1930s. In the late 1940s to early 1950s, part of the land was split off and a house was built (407 J Street). Mr. McBride died in 1954. His widow lived in the house until she died in 1972. Steve Pro bought the house in 1972. Mr Pro restored the interior of the house including removing the paint that covered all the woodwork. He converted a rear window to a door. Several owners occupied the house after Steve Pro. Keith Prior and Karen Bray bought the house in 1994 and sold it in 2005.